Altmetric data is available everywhere. How could library services benefit? Our colleague Kaltrina Nuredini discloses some of her research findings from a Mendeley test case. Over the last years social media tools have been introduced in research and publishing processes. Think out how easy it is to see what is happening with the world. People share their opinions, ideas, and studies through their social media channels. The advancement of this technology shares information in a very short period of time and is certainly impressive. But how can we overcome the information overload on social web? My main research interests are in Social Media. Since Social Media has gained popularity in different scholarly fields, I became interested to discover to what extent Social Media can help to enrich systems like EconBiz. Currently, I am working with the concept of altmetrics measurements. They are used as early indicators to measure the article impact. Furthermore, I am trying to use these metrics for further development. Nowadays, technology breakthroughs led to the creation of altmetrics, which affect the research output. These new metrics have become a buzzword in the last years. They serve as an indicator to measure the scientific impact based on the activity from online tools. Precisely, altmetrics measures the number of times an article has been shared, tweeted, favorited, downloaded, mentioned, viewed, bookmarked or cited. Moreover, articles which are frequently mentioned from online tools seem very likely to be important. I am overwhelmed with how altmetrics can tell a story for shared sources over the Internet, especially research articles. I conducted a test case analysis of 30 economic journal articles with Mendeley, which is a system for managing and sharing research articles. During this test case I drew the conclusion that altmetrics could be understood as another additional proxy for research article evaluation within a specified field. 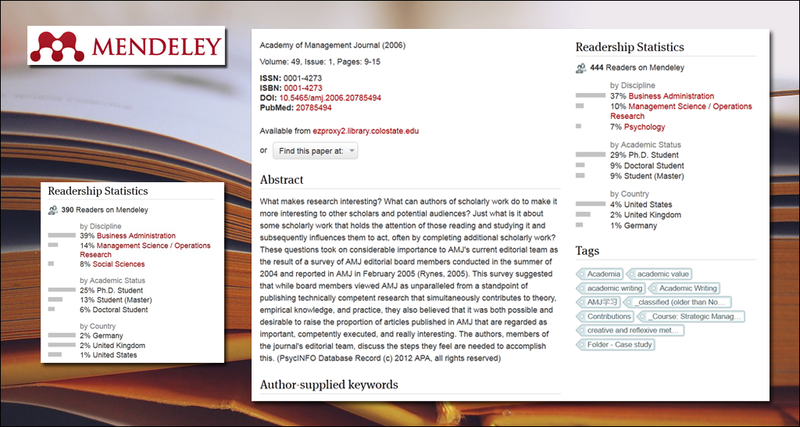 Mendeley offers altmetrics or readership information for every hosted article. They keep track of: “academic status”, “country” and “discipline”. For instance, a saved article in Mendeley can have altmetric information of this type: read by “PhD students (70%)” with “Business Administration focus (66%)” which are coming from “Germany (40%)”. These numbers depict to users whether this article might be interesting for their purposes. The analysis was based on journal level and the results show that Mendeley provides relatively good coverage of research articles for economic and business studies disciplines. The majority of readers are PhD students in Business Administration from USA and Germany (Nuredini, K., & Peters, I, 2015). The results suggest that Mendeley readership data on journal level adds useful information to research evaluation and journal rankings and helps economists to publish in the best journal according to the intended target groups. I know not everyone can agree with altmetrics evaluation. With the digital engagement, many might ask how seriously altmetrics are used during the process of evaluation. Can altmetrics scores be manipulated and give us spurious information? The usage of altmetrics in research evaluation is still in its experimentation phase and more evidence of that validation is needed. But, if we welcome this new trend, it could assist us on finding the advantages or disadvantages. Additionally, it will also help add new useful information for evaluating research articles. Henceforth, libraries cannot ignore altmetrics. Since they move to a digital world, adding the potential of altmetrics properly in digitized repositories will support researchers. It will support them to select what to read and where to publish as well as it will overcome information overload. This will not replace other evaluative metrics, but it will enrich the assessment of the research. As a conclusion, Mendeley can help libraries to attach readership information to articles or journals in their digital repositories. Readership information will allow to observe how readers are engaged with these sources. This does not prevent readers from reading any article, but rather it would help them to choose articles or journals that will suit their needs. Nuredini, K., & Peters, I. (2015). Economic and Business Studies Journals and Readership Information from Mendeley. In F. Pehar, C. Schlögl, & C. Wolff, Re:inventing Information Science in the Networked Society, Proceedings of the 14th International Symposium on Information Science (ISI 2015), Zadar, Croatia (pp. 380-392). Glückstadt: Verlag Werner Hülsbusch.